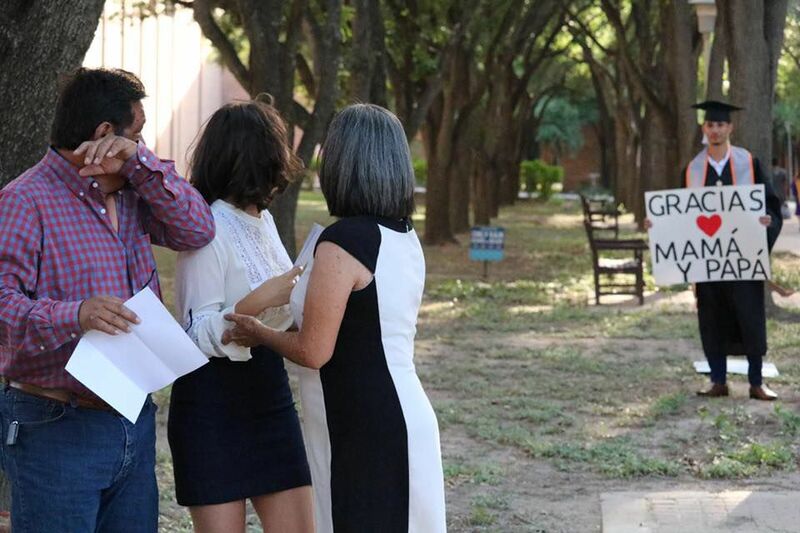 Hanss Mujica surprises his family recently with the news that he had earned his bachelor's degree from the University of Texas-Rio Grande Valley this semester as seen in this series of photos. Mission native Hanss Mujica remembers the look on his parents’ faces when they learned he was suspended from the University of Texas-Pan American in 2013 due to a 1.7 GPA. “I basically flunked out of college,” the 24-year-old said. “The last time I saw that face was the day when they told my parents my brother had passed away. It broke me. Last week, photos of Hanss’ graduation announcement to his unsuspecting parents went viral on social media. 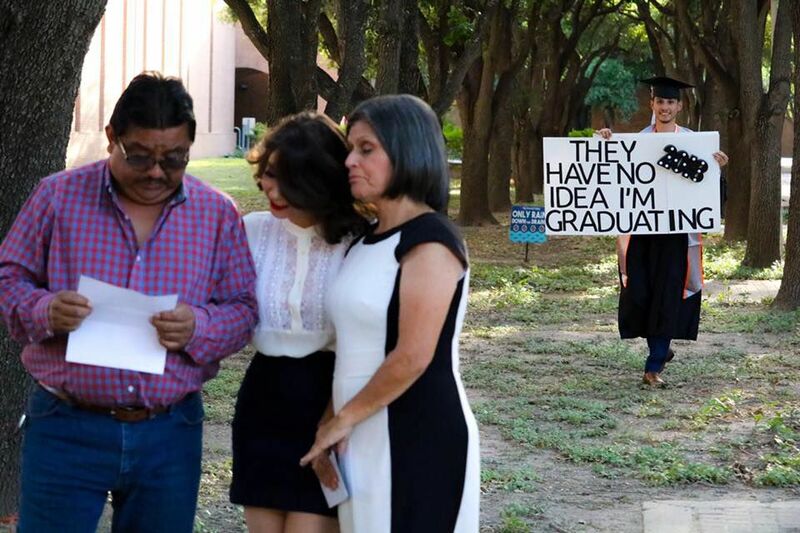 He surprised his parents in his cap, gown and posters during a photo shoot. “It was something very beautiful, very beautiful — something that we’re never going to forget,” said his father, Mario Antonio Mujica, through translation. Hanss said that at Juarez Lincoln High School in La Joya, he “wasn’t that bright of a student.” He recalled difficulties studying and sitting down to do work. These habits followed him to UTPA in 2012, where he ended up on academic probation after his initial semester. “Unfortunately, those same behaviors and attitudes led me to being suspended by the university” his next semester, he said. Hanss returned to school in 2014, but said he lost his federal financial aid. Paying out of pocket, Hanss would take out an emergency loan in summer 2015. He couldn’t repay the amount — which was accruing interest — so he left school again. He works as a bank teller making “decent money,” he said, making payments and paying bills. But he knew he needed more money if he was going to return to finish school. So Hanss reached out to some friends working in refineries upstate. He was hired to help erect scaffolding in May 2016. Within a month and a half working in Port Lavaca, he had the money to pay his loan back. But he kept working to save. “I was mentally prepared that I went there to get money for school, and I was going to come back,” he said. In fall 2016, Hanss was a part-time student at UTRGV and worked as a car salesman at a local dealership. He applied for financial aid, which was approved for spring 2017. He took a full course load until his graduation this month. Hanss said his parents had always instilled the importance of education. Going to school in Mexico, Hanss’ father said his parents encouraged education because they weren’t able to receive it. “Here, you see that you come to work, and you work, work, and work. If you don’t prepare yourself, you’re not going to be anyone here,” Mario said. “Here you come and you work, but if you learn something, life is going to be a little bit easier, financially speaking. 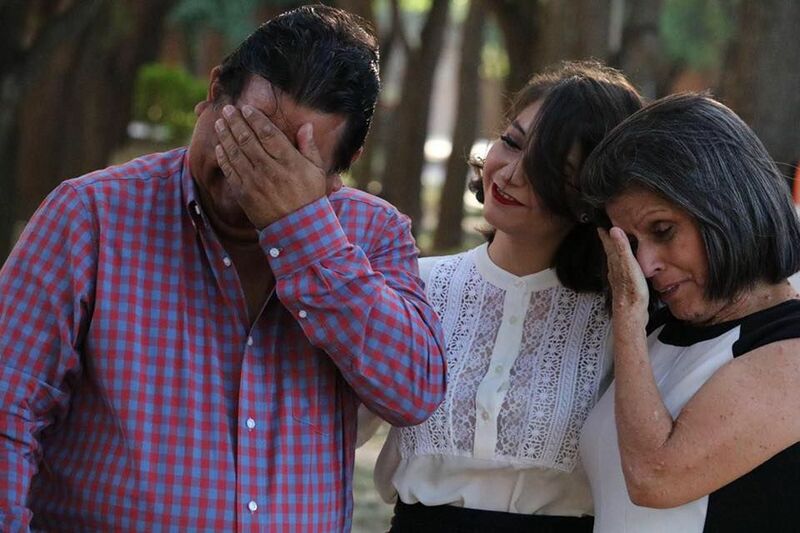 Hanss told his family he needed to take family pictures for a psychology assignment, and snuck away when his father, mother and sister were occupied. He changed to his graduation garb, grabbed his signs and readied himself in the distance. Because of his parents’ support, Hanss said he knew he had to do something for them. The family said it wasn’t something done for publicity, but they hope that people struggling can find inspiration in the situation. “If I can share my story with somebody else that’s struggling or going through the same thing, why not?,” he said.